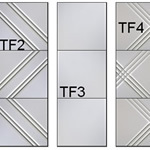 Ceiling tiles are designed to fit into a drop ceiling grid system or surface mount directly onto a ceiling plate. 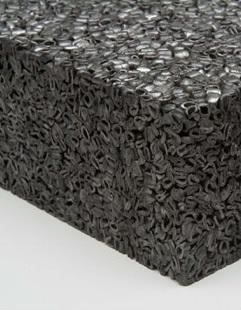 Sound energy can be reflected off of many surfaces within a space and ceiling tiles offer a stealthy, high performance alternative to wall panels. Introducing the worlds first TRI-FUNCTIONAL panel! The dBA stands for Diffusor, Blocker, Absorber. dBA is the only panel in existence that has the ability to perform all three functions in a single panel. Designed for drop ceiling grids, fiberglass ceiling tiles are designed to absorb more sound than standard ceiling tile panels. SB-CT ceiling tiles are available with a white nubby finish or black perforated vinyl. The Poly Acoustic panel is in a class by itself. It is the one product that offers NRC and STC, without the need for composite construction. 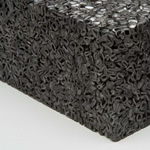 Comprised of recycled, compressed beads, the Poly Acoustic panel is extremely durable and can be pressure washed. 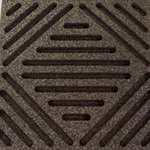 It is ideal for installations that require high impact ratings. Light, flexible ceiling tiles dramatically reduce noise levels in any room. 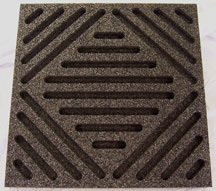 Our ceiling tiles not only look great, they’re top performers when it comes to sound absorption. The melamine ceiling tiles are made from FireFlex Class A fire rated foam making them perfect for use in commercial applications.